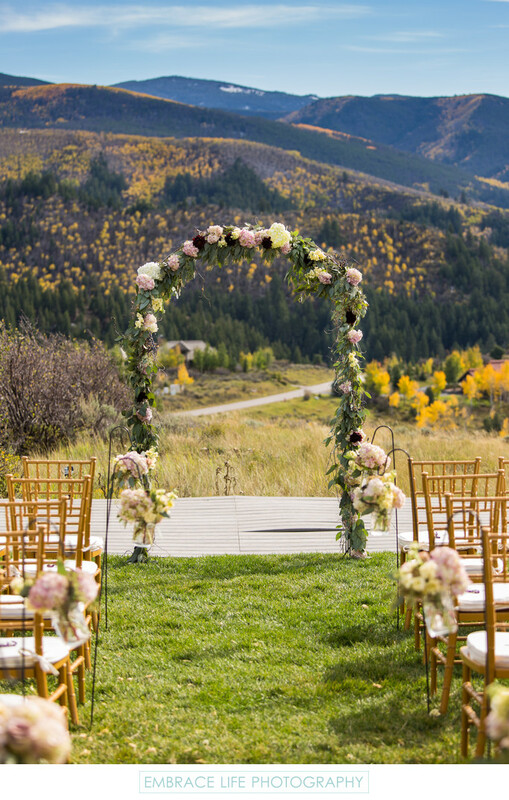 Near Vail, Colorado, this floral wedding ceremony arch frames a spectacular view of the Rocky Mountains, with vibrant autumn color in the tree line, a light dusting of snow on the mountain peaks, and blue sky with whispy clouds. In the foreground, chiavari chairs are divided by green grass, lined with flower arrangements in mason jars, hanging from shepherd hooks, marking the wedding aisle. Location: 2205 Cordillera Way, Edwards, CO 81632.